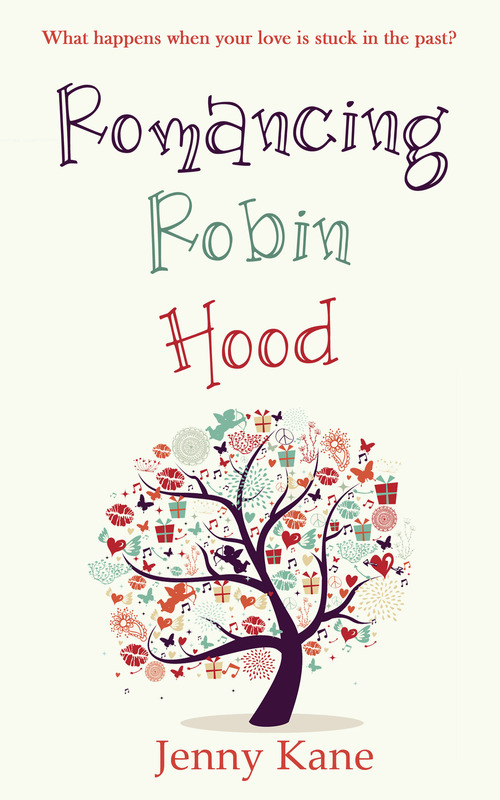 I am so near to the end of drafting my second full length Jenny Kane novel, Romancing Robin Hood, that my fingers simply can’t move across the keyboard fast enough. I can actually taste the words as they hit the screen. Yet, with just two chapters left to draft I’ve pressed the pause button. Before I go any further and tie up all the plot threads, it’s time for me to go right back to the beginning and make sure I haven’t contradicted myself, or accidently changed a character’s eye colour (I once read a novel where the leading lady had blue eyes at the beginning and green eyes at the end once- not good!). 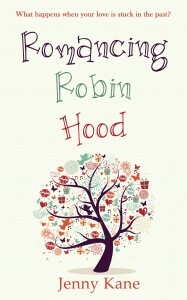 Although Romancing Robin Hood is 60% modern contemporary romance, the remaining part is a Fourteenth century adventure. This is the first time I have written any historical fiction, albeit as only part of a story- or a story within a story, to be more precise. Although I am always paranoid about making factual errors within my work, this time I feel the need to be especially careful. As a result my dining table currently can’t be seen beneath this lot!! I’m in Robin Hood ‘double checking my research’ heaven! 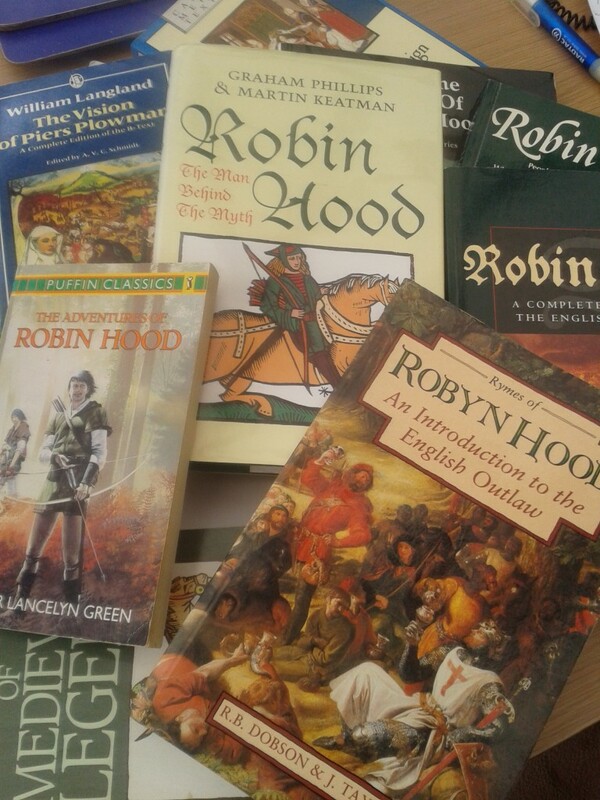 Ever since I was a teenager with a serious outlaw obsession, thanks to Anthony Horowitz’s wonderful Robin of Sherwood, I have been reading books about Robin Hood- an interest which took me through an A’ level history project, a degree, and a Phd in Medieval ballad literature and crime! For the past twenty years I’ve been looking for an excuse to go back through all of my old books and notes- and at last I have it!! I just hope you enjoy reading about Dr Grace Harper and her medieval hero mania, as much as I’m enjoying putting it all together. Dr Grace Harper is a researcher and lecturer in Medieval History- obsessed about the legend of Robin Hood from an early age, she is in the process of writing her magnum opus- a book all about a real medieval criminal gang, who Grace firmly believes gave birth to the Robin Hood legend. She is also writing a novel about the same subject- but so far only her best friend Daisy knows what she’s up to. If her Head of Department finds out Grace isn’t spending her non-teaching time entirely on her text book, he will not be pleased. Life, students, and Daisy’s unexpected wedding- for which Daisy has ordered Grace to be bridesmaid- keep getting in the way of Grace’s research into the life of her fourteenth century protagonist – Mathilda. I’d better get back to it, or you’ll never find out what happens next!